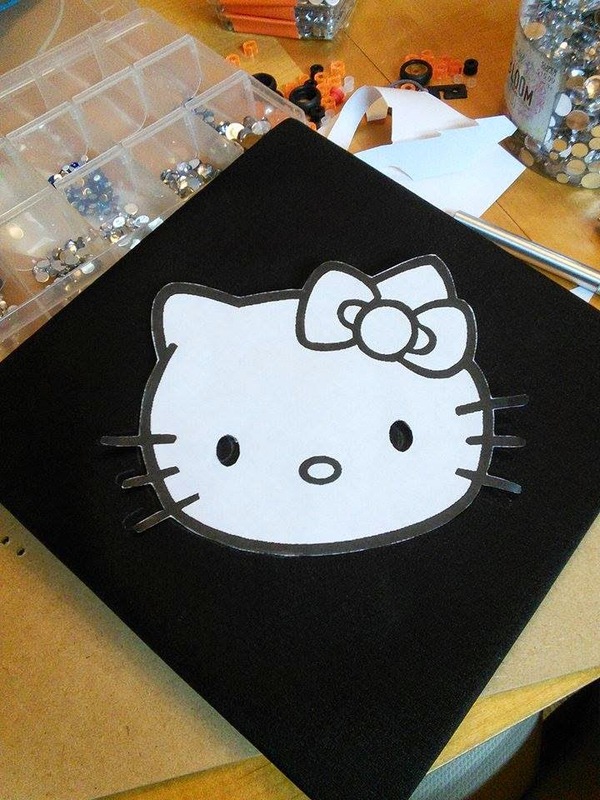 When I graduated, I decided to decorate my graduation cap with something that would allow my family to spot me from the stands, and also personalize it to make it an even cooler keepsake. 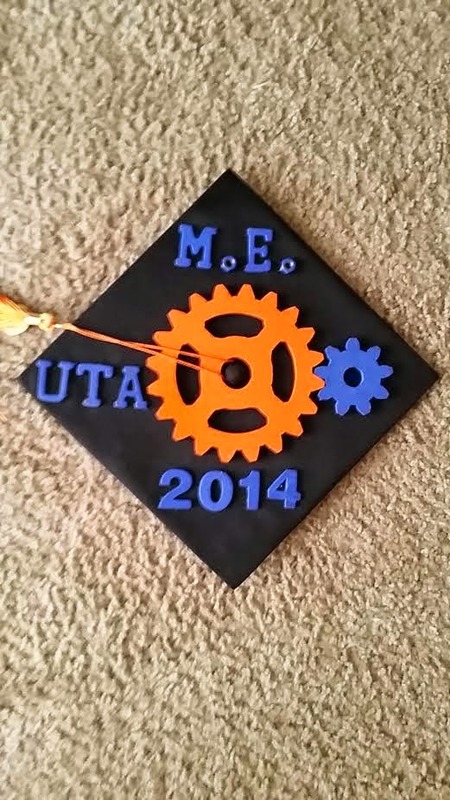 Well my husband graduated last weekend with his mechanical engineering degree, and not only did I decorate his, but I also held a cap decorating party at my house to encourage of a few of the other graduating students to do something with theirs. Since my original post is so popular, I figured I would post these to give ideas and instructions. My original plan was for the planetary gears to move. I bought a small remote control car, and was going to take the motor out of it and mount it to the cap, then have a small belt that went from it, to the planetary. However, I was going to have to add an additional piece of wood to the gear (for the spokes), and Cody told me he didn’t want to added profile. …. : / So no moving gears. But how cool would that have been? Important Note: Before getting started on any design, make sure you know which direction is the front and which is the back! The last thing you want is to forget and it be upside down on the day on graduation. 1) To make the border, I grabbed two boxes of pan head Phillips screws (200 total). Note: I chose this style because once I cut off the head, it would lay flat against the cap. The length doesn’t matter, since I planned on cutting it all off, so I picked the shortest ones they had. 2) I experimented with different ways of cutting off the heads, and the method I picked was to use my Dremel with a small cut off wheel attachment. I would place the screw in the vise, with the head sticking out, then cut right behind the head. To keep the head from just falling down, I grabbed a magnet and stuck it to the body of my vise right below where I was cutting. This caught the head every time. 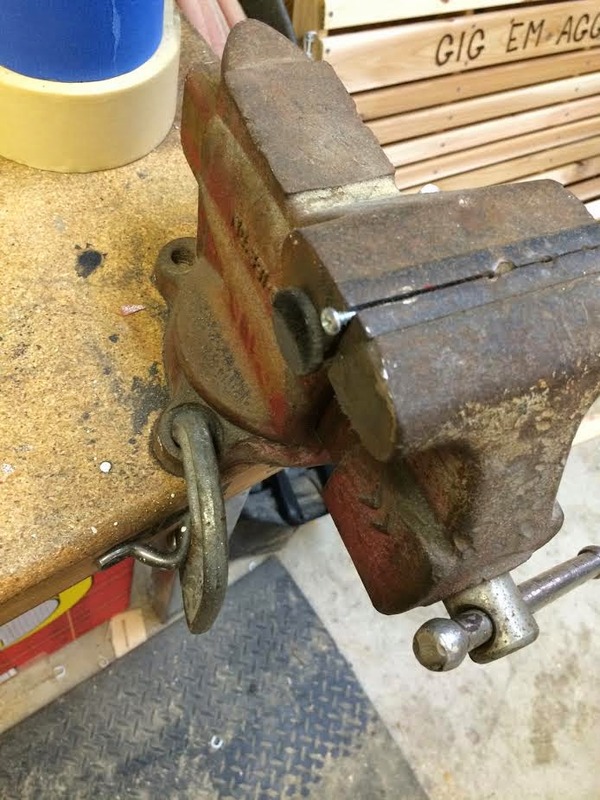 Then, since the head was hot from being cut off, I would use tweezers to grab it and place it in a container then remove the threaded portion of the screw from the vise and repeat. Note: This part of the process took close to 3 hours, which might seem like a lot, but just remember that you don’t graduate every day. 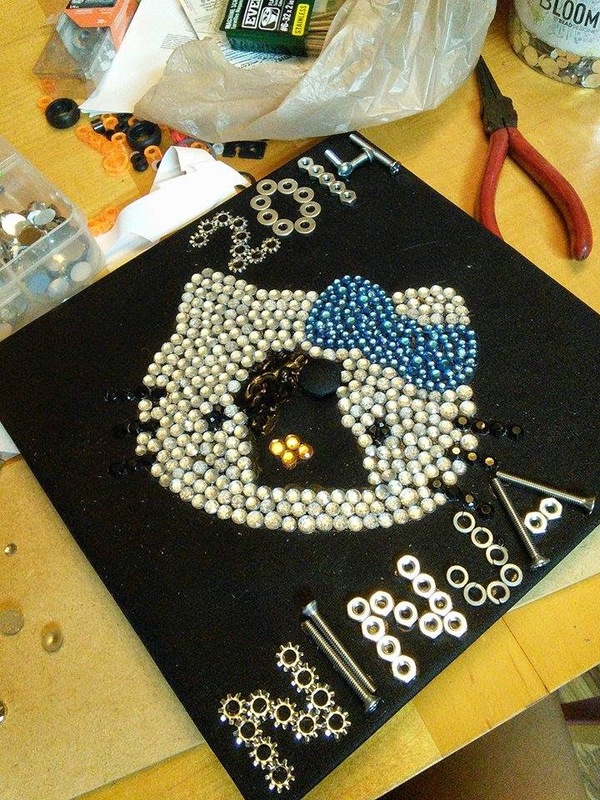 I would really stress for you to pull out all the stops and make your cap exactly the way you want it. Mine still hangs on my wall and this one will be right next to it. 3) Since the school colors are blue and orange, I bought two can of spray paint (for metal) and painted the screw heads. While I was at it, I also painted a few 1/4 nuts blue to use for the 2014. 4) While those were drying, I started working on the gears. To get the gears printed off, I used *this* gear generator, put out by a brilliant engineer/woodworker. Once I printed off the ones I needed, I used a spray adhesive to attach them on some 1/4″ MDF, and used my Dremel Moto-Saw to cut them out. WilkerDon’t: I first cut out gears on some 1/4″ plywood but they turned out awful, so I scrapped them and bought some MDF instead. I would definitely recommend using MDF. 5) To get an idea of how everything was going to look, I traced the cap size onto some spare cardboard and started playing around until I ended up with something I liked. Note: 1/4″ nuts were too large to spell out MAE, so I grabbed some smaller ones. I ended up thinking there was too much blue, so I used a Q-tip and acetone to take off the blue on the nuts. 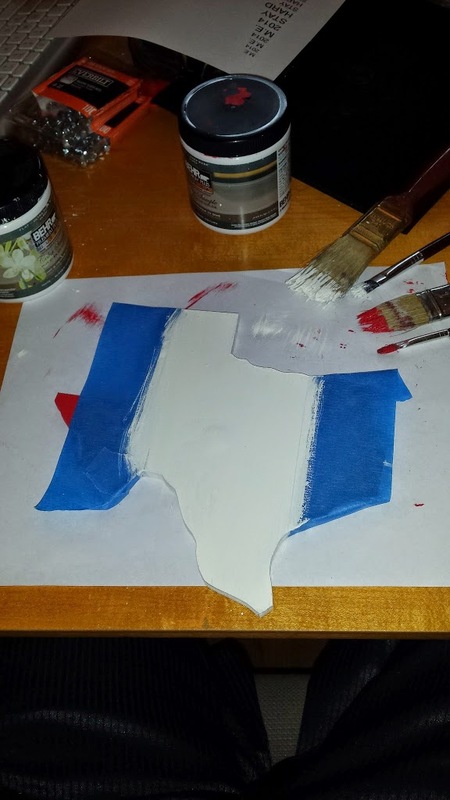 Kyle lives in Texas but was born in Canada so he wanted the shape of Texas but for it to be painted like the Canadian flag. 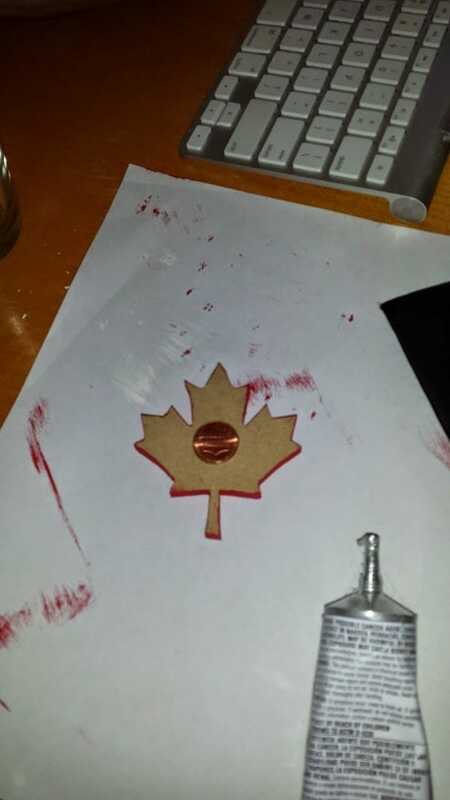 1) I printed off a stencil of Texas and the maple leaf then, once again, used spray adhesive to attach it to a piece of MDF and cut it out. 2) Since this was going right on top of the button (where the tassel typically goes on), I took my router and routed (routerer?) out a spot so it would sit flush against the cap. 3) Next, Kyle started painting. 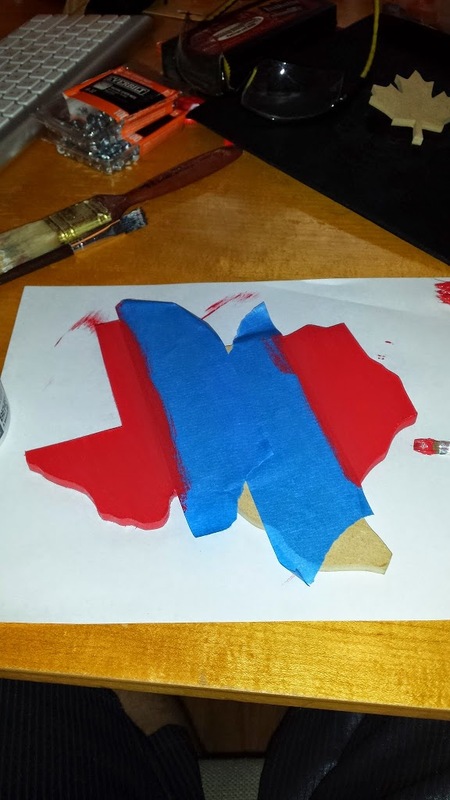 First he taped off the middle and painted on the red. 4) Then taped off the red, and painted on the white. 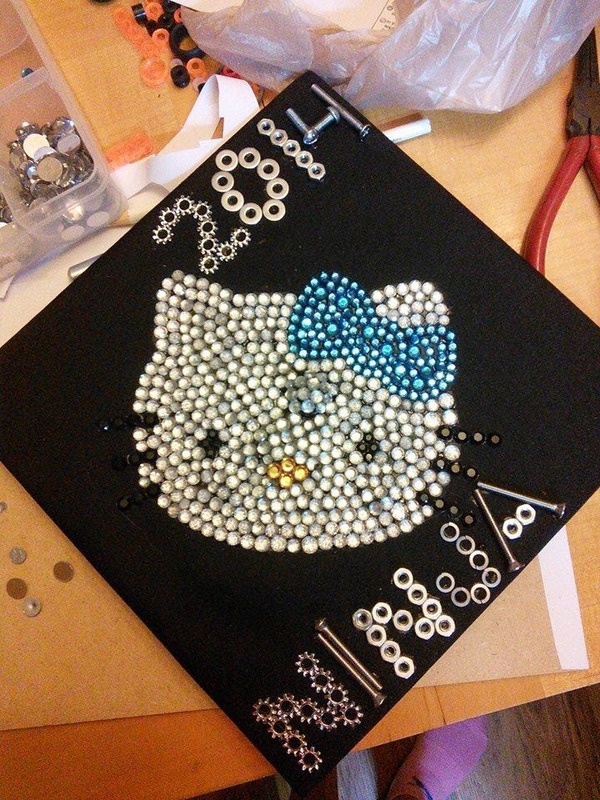 Tiffany wanted Hello Kitty on her cap, but also wanted some hardware to represent the engineer accomplishment, and her college nickname “Ninja”. 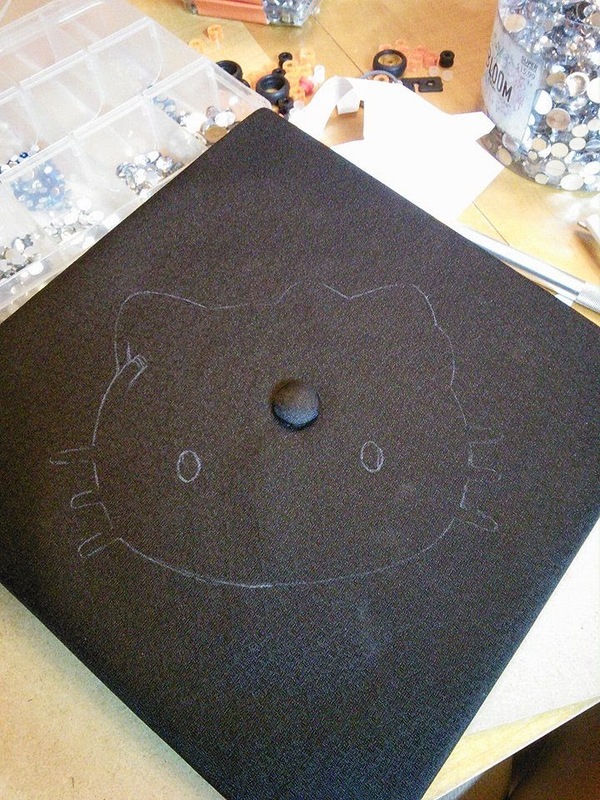 1) She first printed off Hello Kitty and cut her out, then use a white map pencil to trace her outline on the hat. 2) She started with doing the outline and then slowly started filling her in, using E6000 glue. Tip: Instead of placing the glue on the back of the stone, she would smear some glue over a small portion of the hat, then just slide the stone into place. 3) For the hardware, she just grabbed some random stuff at the hardware store and glued it in place! 1) Mark liked the gears on Cody’s, so he printed off one to his liking and I glued it to a piece of MDF and cut it out. 2) Instead of spending all the time cutting out the letters, Mark bought small wooden letters from Hobby Lobby…..he gave everything a quick paint job then used E6000 glue to stick everything in place. I think every one turned out great and on the day of graduation, it was so easy to spot every single one. : ) I don’t know about the rest of the guys, but I plan to put Cody’s in a shadow box as well as some of the other momentous I collected for him on that day. If you are reading this post because you are graduating….congratulations. : ) You rock.